The Holliston Thumbback Windsor Chair has a curved back and bamboo style legs. 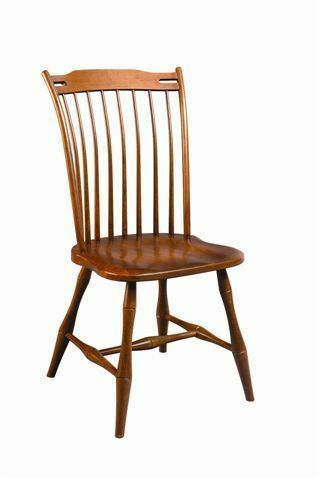 This Windsor chair has a a molded seat and tilt back for comfort and is considered a rod back or stick back style of Windsor. It's also one of our best sellers. DutchCrafters Windsor Chairs are handcrafted the old fashioned way using quality materials and expert craftsmanship. These Holliston Thumbback Windsor Chairs have the feel of an antique Windsor with the classic bamboo style turned legs and slender spindles. The Amish Holliston Thumbback Windsor Chair serves up all the style and comfort that Windsor furniture is known for. Love Windsor style? Check out these stunning Windsor rockers in this quick clip video! Our team of Amish Furniture Specialists is on hand to help answer any questions. We thank you for shopping DutchCrafters for your new Windsor chairs.